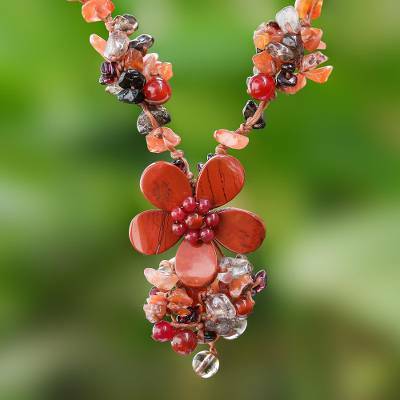 Glistening gems surround a garnet flower in a hand-knotted necklace by Thailand's Nareerat. She selects an elegant assortment of gems that include clusters of chip-cut garnet, carnelian, and smoky quartz. This fashionable accessory can be adjusted to the desired length. You can find multi-gemstone beaded pendant necklace 'Dazzling Bloom' by Nareerat in jewelry categories such as Floral Necklaces, Birthstone Necklaces, Quartz Necklaces, Carnelian Necklaces, Multigem Necklaces, Garnet Necklaces, Smoky Quartz Necklaces, Polyester Necklaces, Beaded Necklaces and Pendant Necklaces. Enjoy exploring these sections for other Novica treasures.